After a whirlwind bus tour around Paris the day before, we’re exploring by foot today. Unfortunately the weather is not cooperating. The skies are cloudy and rainy in the morning, the city enveloped in mist, low clouds scudding over the buildings. The twin white towers of Sacre Cour far across the city are barely visible. The weather man predicts clearing later on, so we stay in our hotel room hoping his forecast will come true. A crow hovers in the wind just outside our 7th story window. As it is Sunday morning, very few people walk the damp streets. No sooner do we see a speck of blue sky than Paris is again dimmed in another shower. By 9:30 Dolores and I, armed with our umbrellas, set off for the Cluny Museum of the Middle Ages, about a mile or two away. Carefully avoiding puddles, we raise our umbrellas against another shower, the rain rattling on the stretched cloth. The bare trees are reflected in the wet sidewalks, reminding me of impressionist paintings by Pissarro who often painted rainy Paris scenes. But we are cold, wet and uncomfortable, a situation far different from looking at one of his paintings in a warm museum. We walk along Rue Montparnasse as far as Boulevard Saint Michel then up that wide way past the Luxemburg Gardens with its gold-tipped fence. We stop at the ruins of a Roman bath that had been constructed in the traditional Roman way by using local stones and flat bricks. Arches hold up the roof. We can still see where they lit the fires underneath to heat the water for the bathers. The cold stones belie the warmth and babble of voices that once echoed in its chambers. We move on to the Cluny Museum, placing our soaked umbrellas in plastic bags passed out by the management. The building housing the museum is itself a 15th century palace. The first room contains elaborate wood carvings of six biblical stories that would have been placed on an altar, making sure that the people, even if they were illiterate, would understand them. A series of tapestries concerning manorial life of the 16th century are in the next room. In them a woman studies her face in a mirror. A falconer holds his falcon on his arm. Most live a luxurious life, particularly a woman who baths in a large tub with attendants and musicians all around her. Even in grim times, at least some people, the nobility, were enjoying the good life. Not as much can be said for the common man. The second room includes fabrics from the Middle Ages, some so old that only fragments of them exist. Priest’s vestments from the 13th to the 15th century and a miter using gold threads from the same age still look good today, could be used today. Just out in the hallway are alabaster carvings of biblical stories from the 15th century. Continuing with art connected to religion we enter a colorful chamber of stained glass, some of it dating from the 13th century. Nearby, a dozen stone saints with their heads missing were formerly decorations of the Notre Dame Cathedral. Victims of religious wars? The highlight of the museum is the tapestry of The Lady and the Unicorn. The characters are on a dark blue island with a scarlet red background strewn with flowers. A woman stands in the center, a lion on one side and a unicorn on the other. Illustrations representing the temptations of the five senses are all around her. . Her placing of a jewel in a casket represents her refusal to capitulate to the passions of the senses. When we walk out of the museum the sun has asserted itself, and the clouds have rolled off to the east leaving a fresh blue sky. The streets are drying out. Just outside the museum we pass a young couple in a sweet embrace, the love and tenderness of the present contrasting to the coldness of the centuries that we have just seen. We trudge up slightly inclined sidewalks to the Parthenon where most of France’s greatest are honored. With its tall, fluted columns and Greek pediment, it resembles a Greek temple. Just beyond, we again enter the Luxemburg Gardens. Many people are strolling the earthen paths although they are still muddy. We look for a bench to rest on but all are wet or spangled with pigeon droppings. Finding no where to relax, we move on to see if we can find St. Sulspice Church, a church that figured prominently in Dan Brown’s The Da Vinci Code. We finally find it, disappointed that much of it is masked in scaffolding. We see enough to realize that it looks more like a Greek temple than the typical gothic church. We briefly step inside and listen to an organ resound in the sanctuary’s emptiness. Back out in the sun again, we look out on the church square with its fountain as well as curious modern sculptures that stand around the square’s perimeter. Checking our map, we decide that Rue Rennes will take us back toward our hotel. We hope to find a place for lunch, both of us being quite hungry after our long walk and the lateness of the afternoon, but it’s Sunday and most restaurants are closed. Finally we find one on Montparnasse, La Consigne. We brave the cigarette smoke and our poor French and take a seat. We first order a beer to slack our thirst. I then select French onion soup and cassoulet, a dish of beans and various meats like sausage and duck. Dolores requests eggplant topped with melted mozzarella and sliced beef along with sautéed potatoes. The food is delicious, expertly prepared. All around us people smoke cigarettes and sip coffee out of little cups. Back in our hotel room, exhausted, we flake out on our bed. It is our last day in France, and we feel good about having savored Paris during the day. 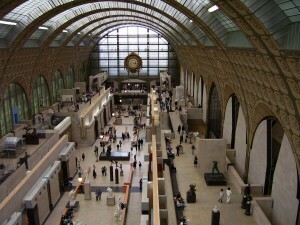 The day before we had enjoyed the paintings at the Musee d'Orsay, formerly a railroad station. 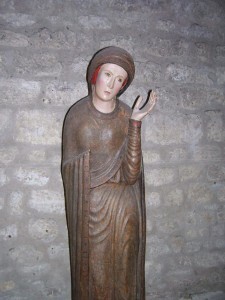 A medieval statue of the Virgin Mary seen at the Cluny Museum. 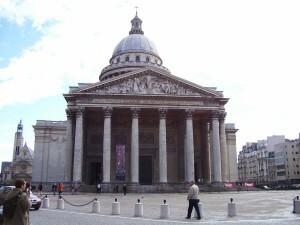 We walk past the Pantheon where France's greatest are buried. Great article! Could ’see’ museum artifacts and paintings myself! And ‘feel’ the cold rainiy day. And almost smell the good food (and cigarette smoke!). Very enjoyable to read.